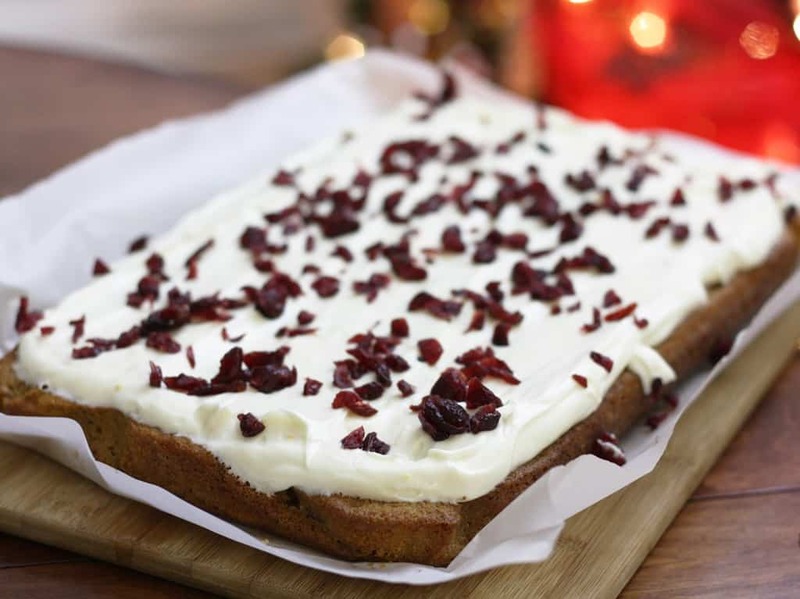 Cranberry Bliss Bars. 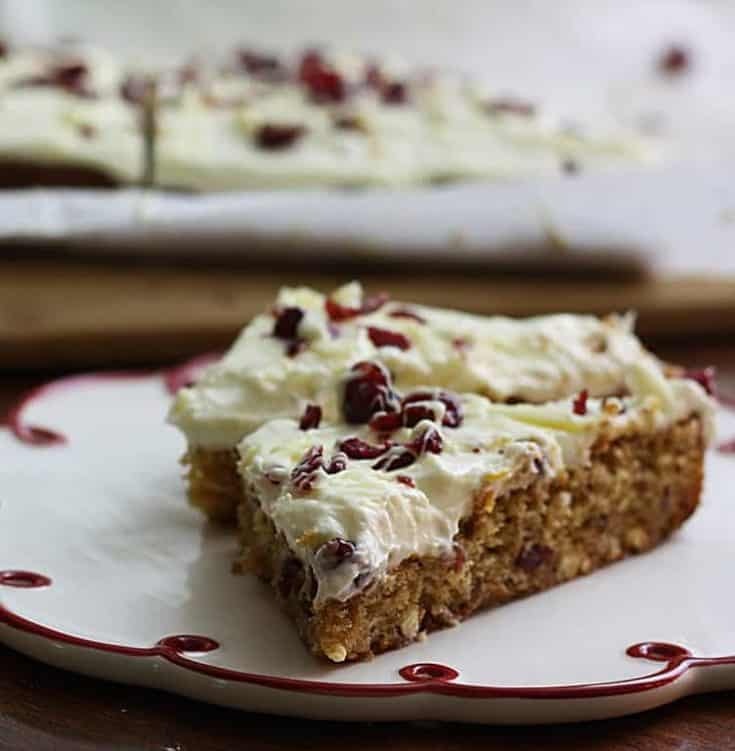 Gluten-free cranberry bliss bars. That is a mouthful, but I needed to stress the gluten-free part. Why? Because if you tied my hands together and threatened to douse me in honey and tie me to an anthill, I would never believe these are GF. I’ve had some pretty good results with using Pamela’s all purpose GF flour, but in the back of my mind, I knew the real test would be these Cranberry Bliss Bars. These bars require a moist but dense blondie layer in order to hold the massive amount of cream cheese frosting. I found the recipe for these last year and they were so good and I may have kept them for myself instead of sharing. I love the mix of ginger, orange, cranberry, and chocolate. But the frosting is what sets these apart. 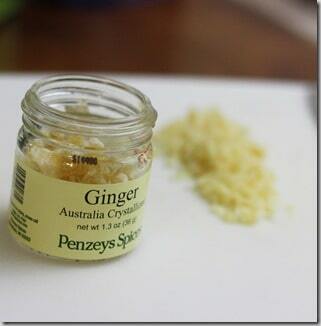 For this recipe, I drastically cut the sugar. 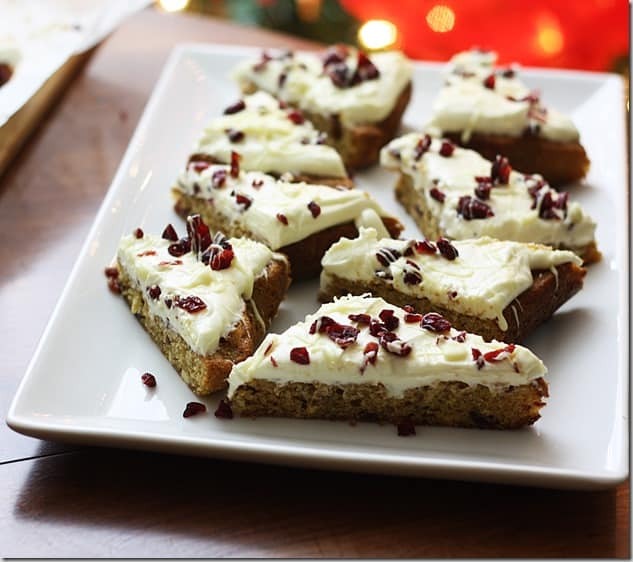 Nobody in my family needs a ton of sugar and I love the tartness of orange zest cream cheese. I admit I had serious doubts about these. I searched for gluten-free recipes. Most called for a delicate combination of various flours that I did not have. I also had doubts concerning the melted white chocolate. I’ve had a lot of trouble this year with it binding up and NOT melting (previous years….absolutely flawless…this year….trouble). But I wanted to try. I wanted to see if I could pull this off with as little difficulty as possible. I went for the most simple. I replaced the regular flour for Pamela’s baking flour mix. I used the same measurements. And that’s all I changed with regards to gluten free baking. The results were so much better than I hoped. They were almost buttery, they were so moist but still had a density that could handle the flavors and the frosting. I was a good little soldier and I shared with my family. They had to compete with other holiday legends such as pecan pie, fudge, divinity, and German’s chocolate cake. I think Grandma had a bite and called it good. That’s all the endorsement I need! 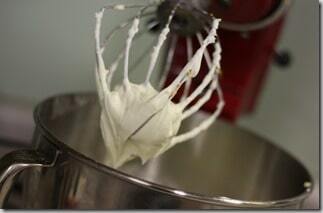 Gradually mix in baking powder and flour until smooth. 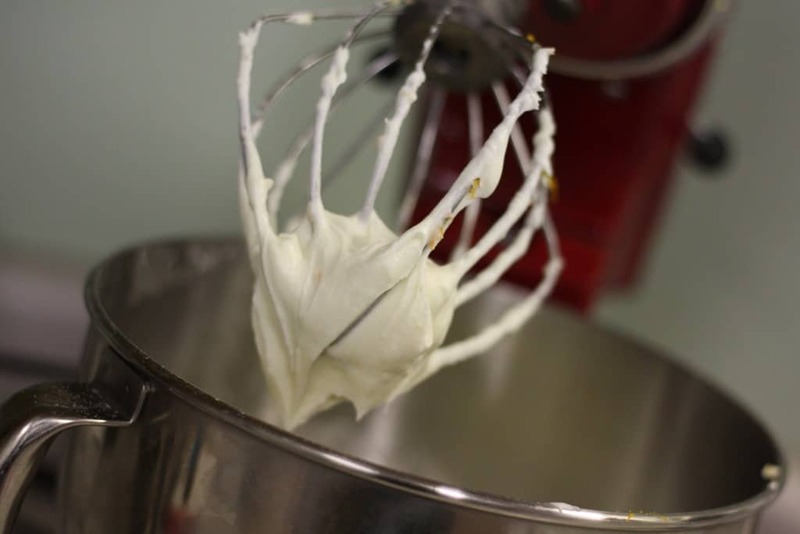 Pour batter into a well-greased 9×13″ baking pan. 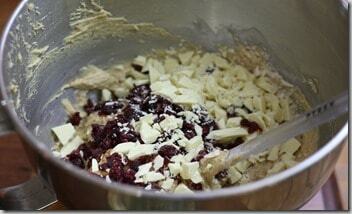 Bake at 350* for 35 to 40 minutes or until cake is light brown on the edges. 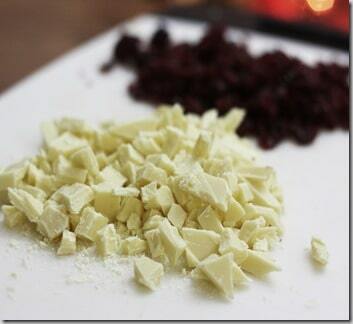 Gradually add half of the melted white chocolate, zest, and extract; beat until blended. Frost brownies. Sprinkle with cranberries. 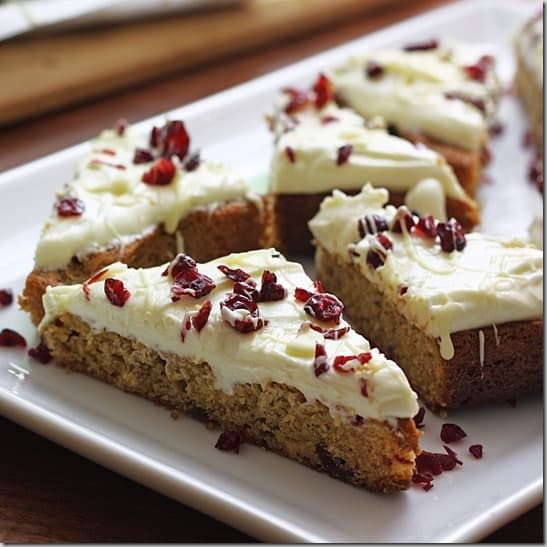 Drizzle with remaining melted white chocolate. Cut into bars- square or triangle-shaped. Store in the refrigerator until ready to serve. Carve out a little time. Clear the counters. Put on some holiday music and make a cup of coffee to sip between layers. This recipe is not just baking. It’s a baking bliss! It would be nice to know how much powdered sugar to put in the frosting. All it says is 1/2 powdered sugar, sifted. 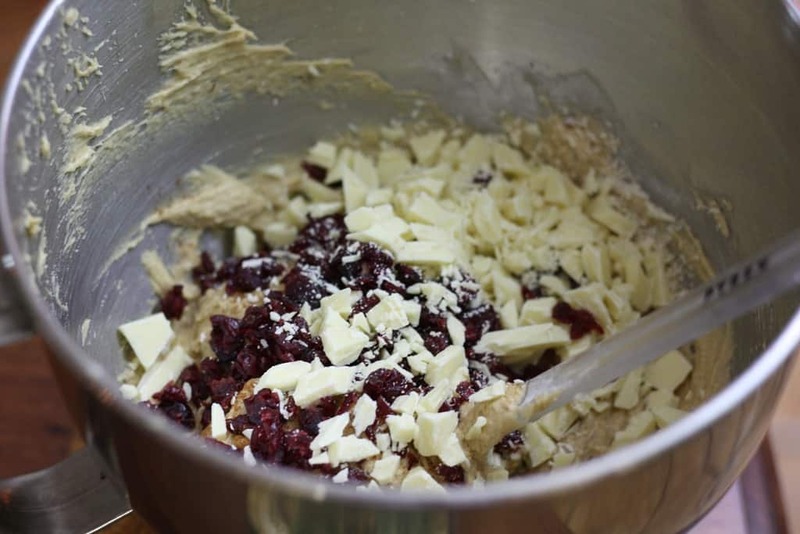 This was for the recipe for GLUTEN FREE STARBUCKS CRANBERRY BLISS BARS. Can you let me know how much it calls for please. I want to make this as soon as I can. I’ve made these twice, and I want to make the blondes a little bit denser and moister. How would I go about doing that? These are amazing! My friends husband who does NOT like GF things argued the fact that these are not GF! And…I happened into SBX recently while they were sampling the real deal. Didn’t like it as much as these ones! I’m so happy to find a better than the original recipe. Thank you so much for sharing with all of us who are GF.